Thinking of staying on a local island in the Maldives? Here’s everything you need to know before booking your trip! 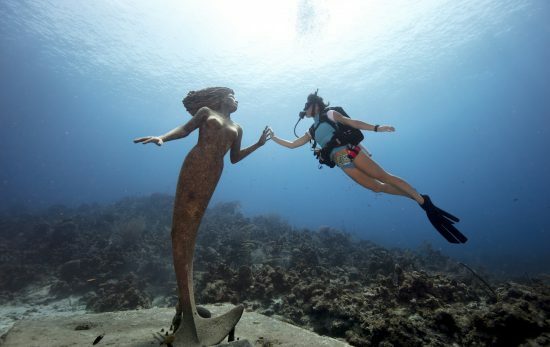 Scuba diving from a local island in the Maldives is still something of a mystery to many divers. Until seven years ago, almost all dive tourists would either choose to dive from a private resort island or from a liveaboard. Guesthouses and tourism establishments, let alone dive centres, were virtually non-existent on any of the 200 or so inhabited islands. These local island villages would welcome tourists on day trips if they had a resort nearby, but remained fairly isolated from the tourism industry and would rarely mix with outsiders. However, thanks to a change in the law, over the past decade local island tourism has boomed and guesthouses and dive centres are being established across the country, making diving the Maldives more affordable than ever! Yet reliable information on planning a local island trip is still fairly hard to come by, especially if you’re looking to go off the beaten track. So here are ten things you need to know when planning your trip to paradise! When organising a trip to a local island, the first thing you have to enquire about is transfers to the island from Male’. Many islands have scheduled speedboats transfers, but some will only have one departure a day. There are also public ferries that reduce the cost of travel massively, with tickets costing only a couple of dollars, but these run even less regularly. So you’re going to want to plan ahead! If you’re going further afield, then you’re probably looking at a domestic flight (if you don’t want to go for an overnight ferry) and these aren’t cheap – for some atolls, such as Addu in the extreme south, it can be 300USD for a round trip from Male’. Oh and don’t expect too many direct transfer options between atolls – most of the time, you’ll have to transit in Male’. 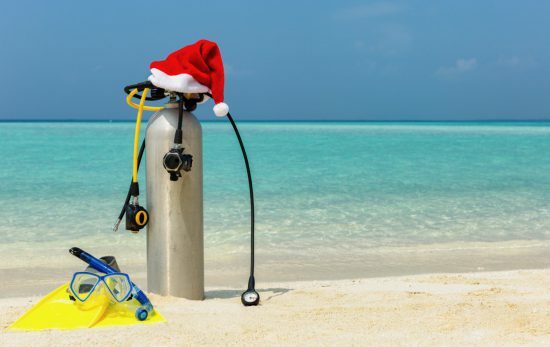 The good news is that most guesthouses or dive centres will organise your transfer for you. Outside of the tourist resorts and liveaboard boats, the Maldives is completely dry due to it being a Muslim country. So if you’re heading to a local island, don’t expect any nightlife! Some of the more touristy islands, such as Maafushi, have got around this rule by having a liveaboard boat with an alcohol license permanently moored outside the lagoon, but generally you’ll be looking at a booze-free holiday. In the Maldives, all hotels on inhabited islands are collectively referred to as guesthouses in order to distinguish them from the private resort islands. However, don’t think that your only choice is sleeping in a bunk bed under a rusty fan! Some of the guesthouses would be more accurately described as boutique hotels, having in-house spas, pools and spacious en-suite rooms. Others are more basic and yes, you can even find the odd dorm room. You can spend anything from around 20USD per person per night, up to 100USD depending on what you’re looking for. Each island in the Maldives has something unique about it. 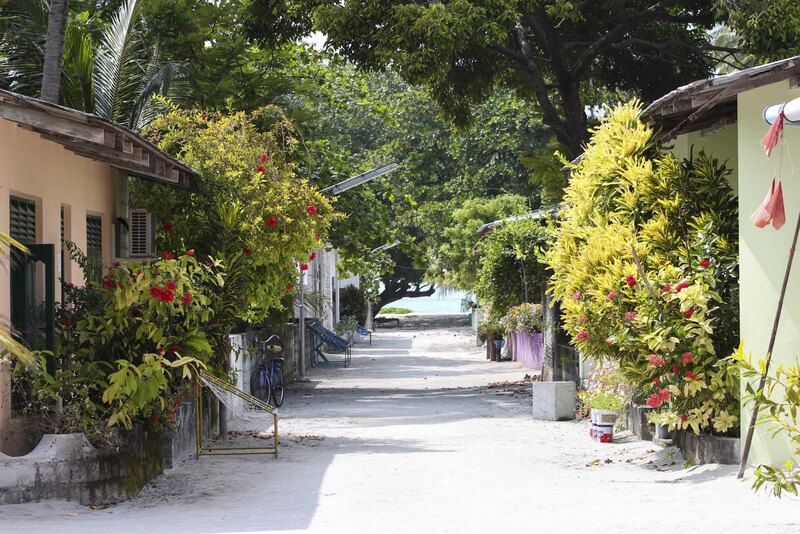 Yes, they all have sandy beaches and swaying palm trees but there’s quite a difference between say, the lively atmosphere of tourist hub Maafushi and the peaceful environment of traffic-free Fulidhoo. Some islands, such as Thulusdhoo are close to excellent surf spots, whereas others, such as Hanimaadhoo, stretch across kilometres and can be explored on a moped. And it’s worth noting that tourism has developed at different rates in different islands so some might not have the facilities you’re looking for. 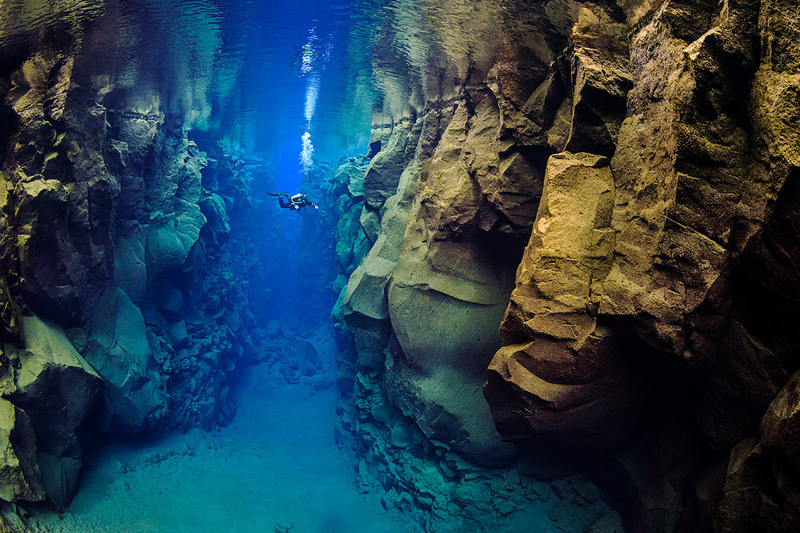 This is where a bit of research goes a long way to make sure you’re getting the dives you’re looking for. Whale sharks, for example, are found almost all year round in South Ari Atoll and occasionally they pop up in Baa Atoll, but in other atolls, they’re a rarity. Diving with dozens of reef sharks and nurse sharks is common all year in Vaavu Atoll but in some other atolls they can be harder to find. Why is this important to know? Well, it’s good to bear it in mind when spending time amongst the locals. 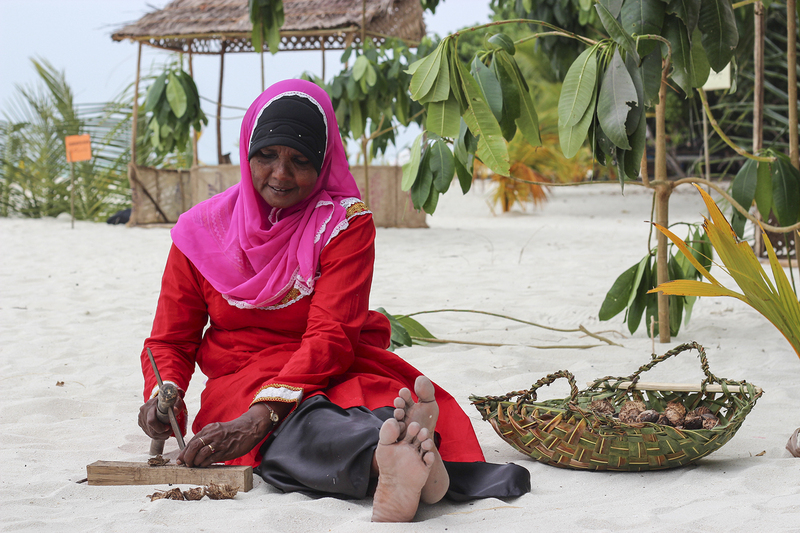 Maldivians are known to be extremely friendly and many have years of experience in luxury resorts, but others, especially the older generation, are still getting accustomed to having foreigners on their islands. The best thing to do is to approach people with a friendly wave, and you’ll soon have a gaggle of women around you wanting to interview you! Expect simple food and lots of fish! The variety of food available will really depend on how touristy the island you choose is. Some guesthouses make incredible local and regional dishes, such as curries and grilled fish and fried rice but local cafés are just that – for locals, so don’t be surprised if the menu isn’t quite what you’d expect. Vegetarians should always double check if there’s fish in a dish, because no meal is complete without a bit of tuna here! Roughly speaking, November to April is considered the high season for scuba diving in the Maldives, with January to April being the absolute peak season with incredible viz, conditions and wildlife encounters. However, don’t be too fast to rule out low season – it’s quieter, cheaper, can be sunny for weeks on end and the wildlife encounters are still incredible (but you might have to sacrifice some viz). Due to climate change, the weather in the Maldives is becoming a little more unpredictable so there’s never a guarantee it won’t rain, whatever the season. 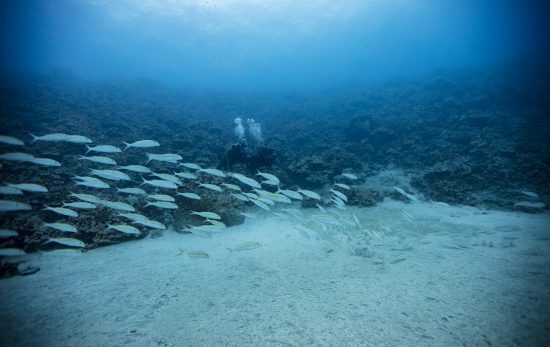 It’s fair to say that some of the best dives in Maldives can have some serious current, and conditions can be challenging, even for seasoned divers. Of course, the pay off can be huge, with dive sites like Miyaru Kandu in Vaavu Atoll regularly seeing schools of sharks and rays and abundant pelagic life. 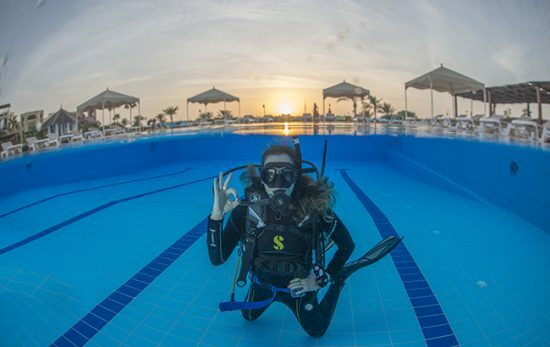 So you’ll want to be fairly experienced before trying these dives and a PADI specialty in Drift Diving might also be a good idea. As the Maldives is a Muslim country, you can’t walk around in the public areas in swimwear. The general recommendation, for both men and women, is covering shoulders to knees when walking in the village or on public beaches. Most islands with guesthouses now have designated ‘bikini beaches’ where swimwear is allowed, but just remember to throw a sarong on when you leave the beach or the dive boat. Find out more about diving in the Maldives with our PADI Travel Scuba Guide. 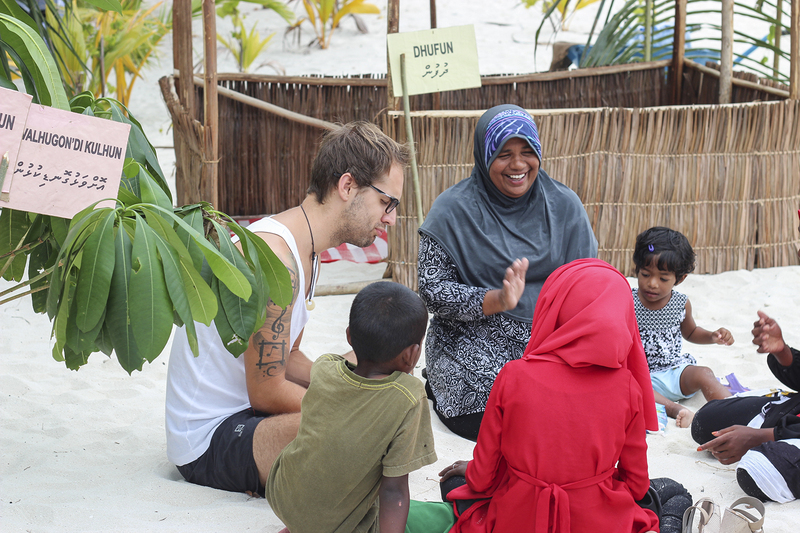 Adele Verdier-Ali is the co-owner of Fulidhoo Dive, alongside Maldivian PADI Staff Instructor Ali Miuraj. 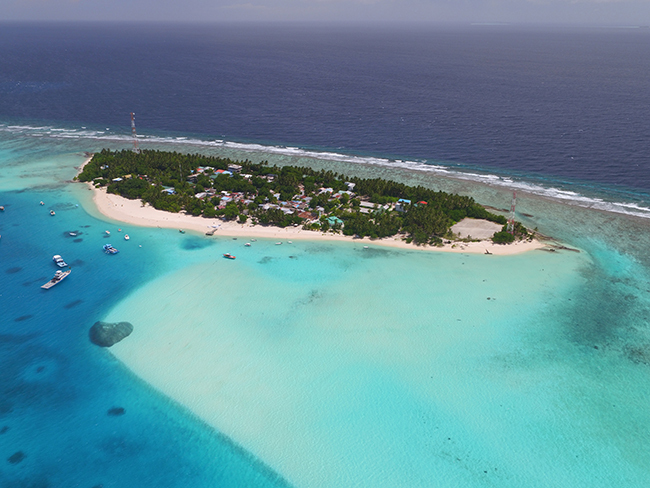 Fulidhoo Dive is a 5-Star PADI Dive Centre on the local island of Fulidhoo in Vaavu Atoll.